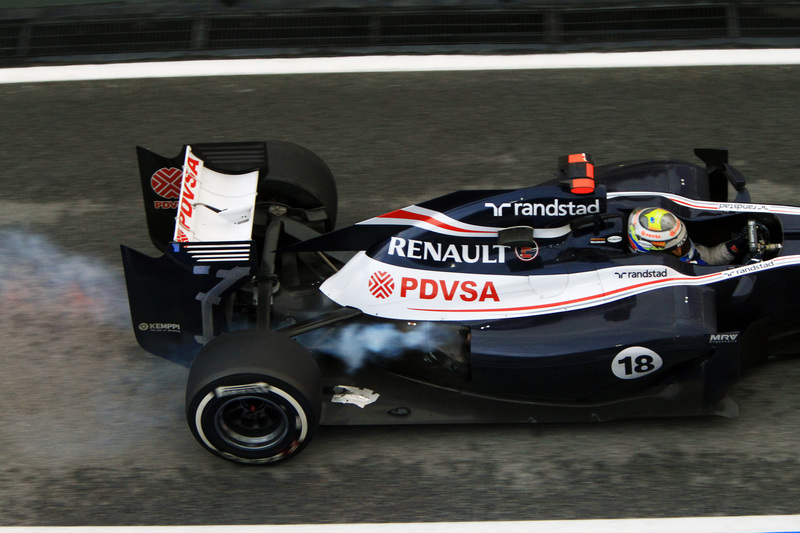 What was the cause of the Williams’ engine failure? Initial inspection at the track showed a piston failure. We shipped the unit back to Viry after the race where it was inspected thoroughly yet again when we stripped it down. We then confirmed that one of the eight pistons had suffered a surface crack that had allowed fluids to leak through, causing a sudden loss of engine pressure. It appears that the crack came from a machined radius on one of the piston legs. This sudden failure was restricted to just one piston – the remaining seven were fine. This was the first time for some while we had experienced this problem and we were particularly surprised considering we had had a trouble free winter in this area, both on the dyno and on track. No. This is the first time we have experienced this problem. We feel this was a one-off failure, but as we still do not fully understand the root of this problem, investigations are still ongoing and we will take some time to introduce complete counter measures. It is fair to say that we were very surprised, particularly as it happened so early in the engine life. What safeguards have been put in place? We have specifically built new engines (two per customer) for China which feature a new piston specification we know will address part of the problem. This has been approved by the FIA via a formal request. As we could not find any problems with the actual broken piston (the inspection process and quality control from the piston supplier could not find any further issues), we will also put in place some safer engine settings for China. Williams had some engine problems before in pre-season testing? Was this linked to the Malaysia problem? No, it is not at all linked. This was a one-off issue that occurred suddenly. We have obviously run through the way the engine was operated so far this season but we could not find anything out of our usual scope that would explain the failure. Can this engine be used again? The actual engine can be used again but not in a race situation for Pastor as it has been taken out of his engine pool. Nevertheless, as only one piston was affected, we will put the engine back together with a brand new piston and re-run it on the dyno to determine if it could have lasted its entire life. This work is in progress and we already have some indications. In the meantime, as we only have seven engines left for Pastor, we have worked out an alternative engine plan for the rest of the season so Pastor will not be penalized beyond the position lost in Sepang. I wonder how will Renault make it up to Williams/Maldanado? Given the restriction on number of engines that a driver can use in any season, to lose an engine in race 2 of 19(or 20) race season can mean a lot especially at end of the season.